Want something a little different and really beautiful for your holiday table? Look no further than this lovely cream cheese pound cake! 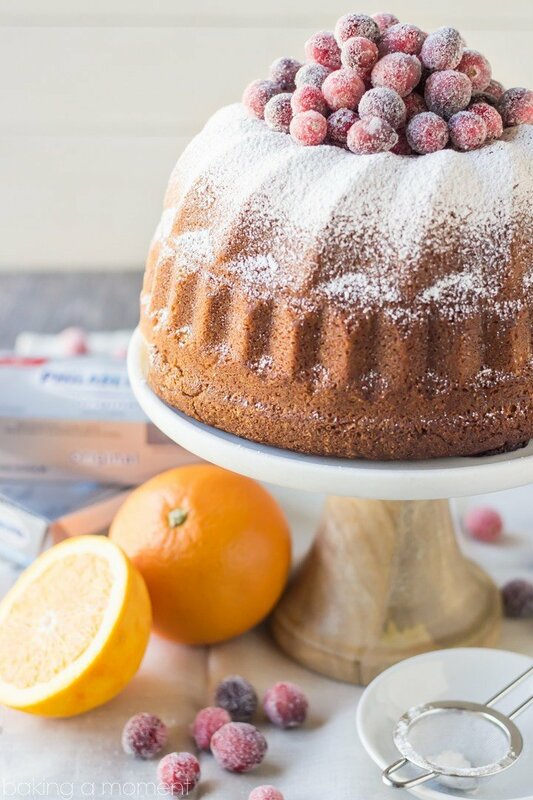 It’s infused with sunny orange and subtly spiced with ginger and clove for a flavor that’s unmistakably “holiday.” Fill the cavity of the Bundt with sweet and seasonal sugared cranberries for a presentation that will make your guests ooh and ahh! I’m so excited that the holidays are almost here! This is by far the best time of year for baking. I love it when our extended family comes in and I can spoil them with all sorts of fabulous desserts! It wouldn’t be Thanksgiving if we didn’t have pumpkin pie, apple pie, and pecan pie. But I also enjoy breaking with tradition for at least one of my dessert offerings, and sharing something a little different. This year, it’s cake! A luscious cream cheese pound cake, to be exact. I just love the addition of Philadelphia Cream Cheese in pound cake. It makes the texture so velvety, and gives it the most subtly tangy richness. And the combination of orange and winter spice always reminds me of those pomander balls my mom used to decorate our house with–the ones where you stick the whole cloves into the oranges. They make the whole house smell incredible and I can’t help but associate those aromas with Thanksgiving and Christmas. So this cake is infused with orange and has just a hint of warm spice. Just enough to really put you in the holiday mood. These flavors are a perfect accompaniment to cranberry! And the sugared cranberries look so gorgeous spilling out of the center cavity of the Bundt cake. Really pile them on; they taste every bit as good as they look! I think you’ll really love the tangy flavor and added richness the cream cheese brings to this pound cake recipe. I love using Philadelphia Cream Cheese in my baking; nothing else tastes quite like it. Plus, it’s made with real milk and cream and has no added preservatives, so it’s wholesome goodness that I really feel good about serving to my loved ones. Thanks to Philadelphia Cream Cheese for allowing me to partner with them to come up with some fun and delicious recipes! I had a blast. Do you have any favorite holiday recipes using Philadelphia Cream Cheese? I’d love to hear your favorites in the comments below. For additional inspiration, click here. Want something a little different and really beautiful for your holiday table? 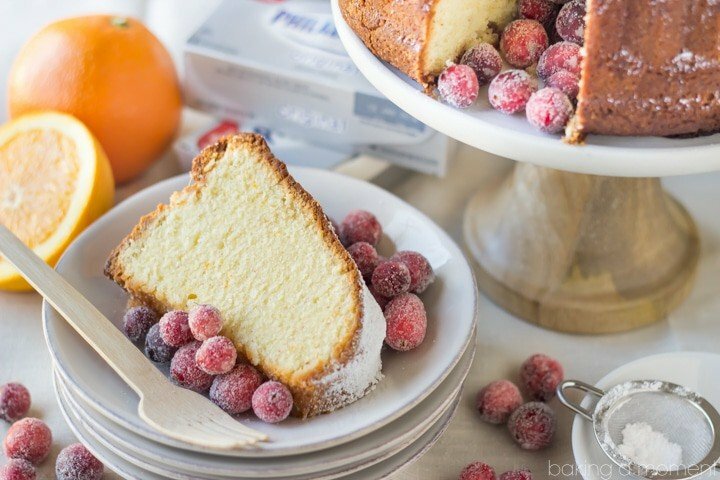 Look no further than this lovely cream cheese pound cake! It's infused with sunny orange and subtly spiced with ginger and clove for a flavor that's unmistakably "holiday." 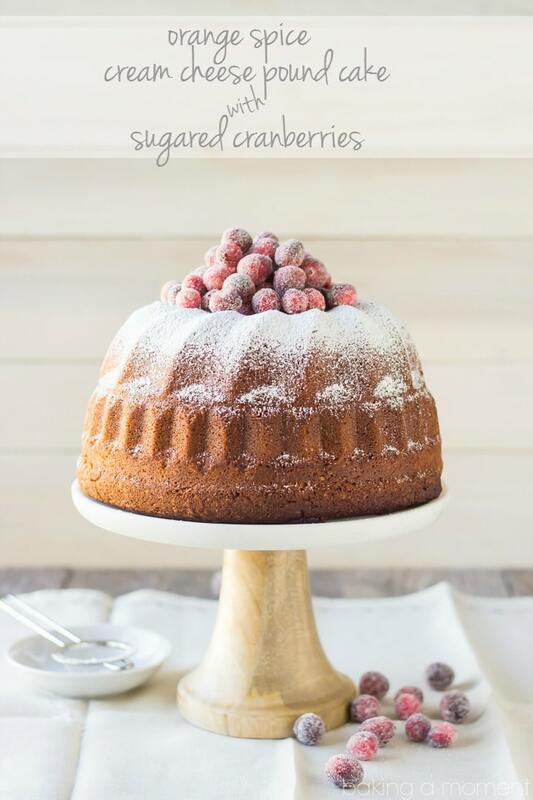 Fill the cavity of the Bundt with sweet and seasonal sugared cranberries for a presentation that will make your guests ooh and ahh! Preheat the oven to 350 degrees F and generously mist a 10-cup Bundt pan with nonstick spray. Place the butter and Philadelphia Cream Cheese in a large mixing bowl, mixing together until smooth and well-blended. Add the sugar and whip on medium-high speed until very pale and fluffy (about 5 minutes). Add the eggs, one at a time, scraping the sides and bottom of the bowl with a silicone spatula after each addition. Stir in the orange juice, zest, and vanilla. Add the flour, 1 ½ cups at a time. When all the flour has been incorporated, stir in the salt, ginger, and cloves. Transfer the batter to the prepared Bundt. Bake for 70 to 80 minutes*, or until a bamboo skewer inserted in the thickest part of the cake comes out clean or with a few moist crumbs. Cool in the pan for 20 minutes, then invert onto a wire rack to cool completely. 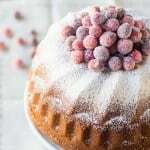 Dust with powdered sugar, and fill the center of the Bundt with sugared cranberries, for garnish. Place the water and ½ cup sugar in a medium pot, and place over medium-low heat. Bring to a low simmer, stirring, just until the sugar is completely dissolved. Toss the cranberries in the simple syrup, to coat. Drain the cranberries, and spread in single layer on a wire rack. Allow to dry for about 8 hours, or until no longer wet but sticky to the touch. Roll in remaining granulated sugar to coat (you may have some sugar left over). Sugared cranberries can be stored in the refrigerator, in an airtight container, for up to a week. Bake times may vary, depending on the shape of the pan. Allie, this cream cheese pound cake is a stunner!!! what a great dessert idea for the holidays, I love this!!!! Beautiful! What a gorgeous cake! The sugared cranberries are such a pretty finishing touch. I’ve never had cream cheese in a pound cake, but I’m looking forward to trying it! I couldn’t agree more! I loved the creamy texture + tang from the cream cheese. Thanks a bunch, Sarah! Another great photo and recipe that is perfect for the holidays! Aw, thank you so much Nicole! This pound cake is fabulous! I can only imagine how wonderful the cream cheese is in here. WOW! Talk about a show stopping dessert! This cake is beyond gorgeous, Allie!! It also sounds seriously delicious! I’m a bit cream cheese obsessed, so a cream cheese pound cake sounds amazing on it’s own. But, of course you being all sort of awesome, took that idea totally over the top!! The orange spice in the cake and the sugared cranberries on top are killing it. PINNED! Wish I lived closer, I would invite myself over for your Thanksgiving dinner! 😉 Cheers, my dear! You would always be welcome! Next time you find yourself in PA, just give me a buzz. Thanks girlfriend! Oh wow…this pound cake is sure a show stopper. Love every bits you add in this cake and what a stunning cake! What a gorgeous pound cake! I love using sugared cranberries – they are just so so pretty! And I bet this is delicious with the cream cheese! They are so pretty- I completely agree! And I love the way they taste too. Such a great balance to all the creamy richness. Thank you so much Ashley! Allie this cake is a showstopper! 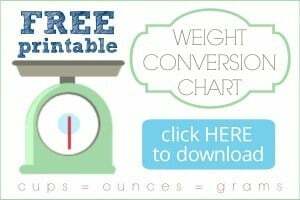 Just amazing – pinned!! Thanks Medha! I really loved it- especially with that creamy cream cheese! Totally gorgeous Allie!! Love, love, love those sugared cranberries! Allie, your cake is great. I would love you to stop by Food on Friday: Cakes over at Carole’s Chatter to add this to the cake collection! Cheers! Such a beautiful cake, I plan on making a bundt cake in December using sugared cranberries so will be using your recipe for it. I’m intrigued by the cake having cream cheese in it, it looks so tender and dense, delicious!! Allie, this cake looks amazing!! And I love that you used Philadelphia! I swear it’s the only cream cheese I will bake with. It’s just perfect. I know, right? I mean, are there even other brands? I wouldn’t know, lol. Thanks so much for popping by and for the sweet comment, Lisa! Oh wouldn’t that be fun! Happy Thanksgiving Tess! I made this cake yesterday and while delicious, I found it to be too salty. I questioned the addition of 2 t. of salt, but added it anyway. Wish I had just added 1 t., which is what most recipes call for. I’m so sorry you weren’t happy with it! Just thinking about your comment and wondering… did you use kosher salt or table salt? Can’t wait to try sweet potato biscuits & this pound cake. My aunts always used cake flour. It makes such a difference! Hope you enjoy Beverly!